S.T.Dupont Magic Wishes fountain pen is dedicated to the tale of "Aladdin and the magic lamp". 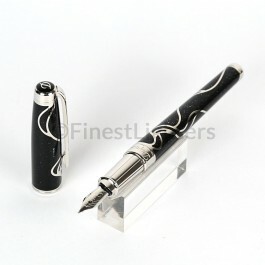 The pen is finished in palladium and black Chinese lacquer, in which silver powder was embedded. The body of the pen is decorated with a motif in palladium, depicting the curl of smoke coming out from the lamp when the genie appears. Launched in 2011, only 888 individually numbered pieces of this pen were made.